* Includes grill - 8 1/2" Sq. 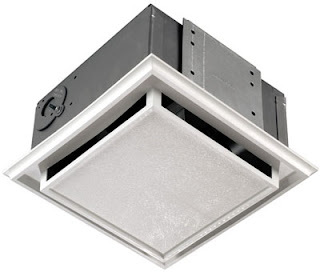 The Broan Ductless Bathroom Exhaust Fan can be installed in the ceiling or in a wall and does not require any ducting. An activated charcoal filter keeps the air fresh. The motor is 120 volts with a 1.0 amp rating and can be removed for cleaning and service. The exhaust fan is 8-1/2 inches square, and features a white polymeric grille with tension spring mounting. Optional control switches are available separately. Choose the Variable Speed Decoarator Wall Control, the Two-Function Rocker Control, or the Single-Function Rocker Control, which are available in Ivory or White. The fan is IC rated and UL listed. BR-57V/W Variable Speed Control:Electronic Variable Speed 3 amp capacity. 120V control fits in a single gang box. Positive on/off action dial for variable selection of air speeds and sound levels. BR-69VL/WL Single Function Control with Indicator: 120V, 20 amps control with red light lets you know when the power is on. Fits in a single gang box. BR-68V/W - Two Function Rocker Control: Two, independent, 120 VAC, 15 Amp rocker switches (20 Amp total) fit a single-gang box. Available in Ivory or White.